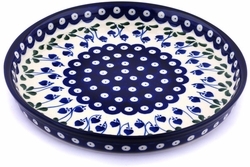 Polish Pottery Cookie Platter is a great addition to your table. Use as a gorgeous stand-alone piece of decor or as a functional part of your everyday serving. All our platters are handmade and hand painted. This stoneware platter is hand crafted at famous Ceramika Artystyczna factory, Poland.